Back in 2015, Apple received a patent for a curved screen that wrapped around the front and sides of an iPhone. The regular buttons would be replaced by virtual representations along the sides, and the implementation includes a flexible screen. Obviously this approach hasn't been used yet by the company, although Apple did receive a new patent today which covers an "Electronic device with wrap-around housing." According to the patent, content can be viewed on any portion of the wrap-around display. In addition, the device would use a pair of user interfaces. One would be employed for "the central portion of the transparent housing component, and a second user interface comprising a control input through at least one of the peripheral portions of the transparent housing component." Similar to what was mentioned in the 2015 patent, in one version of the wrap-around screen, a second flexible display is used to create a 3D-like effect on the phone. 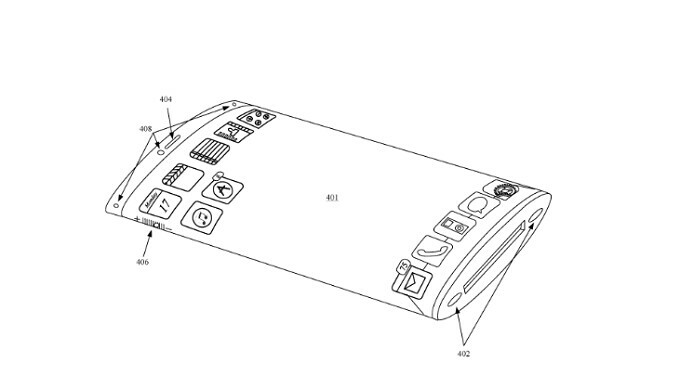 The patent also covers the use of a wrap-around screen to create a "multi-display electronic portable device." Apple originally filed a patent application for an "Electronic device with wrap-around housing" in May, 2016. The United States Patent and Trademark Office assigned it a U.S. patent number of 9,983,630. Will Apple use this design in a future iPhone model? We certainly wouldn't rule it out although we wouldn't expect to see something like this until 2020 at the earliest. Check out images from the patent at the top of this story, and in the slideshow below. Would be the biggest gimmick of all time. How the hell would you even hold it. Talk about accidental screen touchs. Never been an apple fan or purchased any of their products but i hate how some Samsung sheeps blindly think that everything is copied from Samsung. Have a look at that patent and tell me where does that thing even remotely resembles a Galaxy or any Samsung for god's sake ? As Apple themselves have said, when viewed from a distance they look identical. As a current iPhone user, I can tell you that is a terrible design. Besides, they’ve been teasing that layout since 2012 and I don’t believe they would actually release it. That would be the stupidest design of all time, I DONT CARE who would be the one that does it, it's stupid. Yeah I didn’t like that too (no I hated that), one of the major reasons I switched from Samsung for the time being. I was thinking about Active version - but it’s too bulky. Apple better not follow the trend. Man, everyone said that!!!! Not just IFans. 1. Useless, yes! 2. Gimmicky, yes! (Looks nice, but see #1) 3. Hard to handle, yes! After years of using - I still have accidental input with either palm or bottom of finger when reaching. 4. Easier to break,you seriously wanna argue this one? This will not change for any device - these are true facts! Wireless charging is still pretty useless, AMOLED screens were bad before Apple made it better with X. I don't think anyone hates stylus? :) it's just a pen. Also i still don't see any reason to use stylus with the phone, in other hand i own one with my iPad Pro and it's great for making graphics, i see zero reason to use it with phone. Pretty sure my iPhone X has a wrap around display already. Look at the diagrams. Apple had to do this to reach the top and bottom of phones. If they expose it it better be just display and not touch ability because that would be one frustrating device to use. But I agree with everyone here - they’ve been hinting this design for, like, evah! It’s ufly and reminds me of a deodorant stick. They may never manufacture it. These screens won't be coming from LG. They are still so far behind what Samsung has been churning out. looks like an apple pie box.